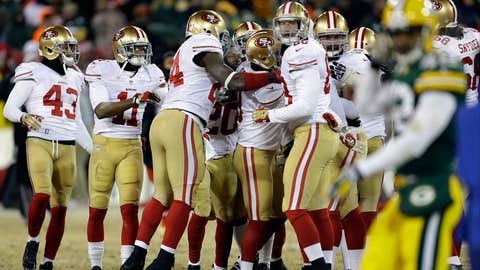 San Francisco 49ers players celebrate after kicker Phil Dawson kicks the game winning field goal during the second half of the NFL wild-card playoff game against the Green Bay Packers. The last kick of the San Franciso 49ers-Green Bay Packers NFC Wildcard game last week was good, like so many of them were before, and though the stakes have never been higher for Phil Dawson, he looks at that game-winning field goal one way. The same way he looked at so many of them before. And, like this. "I’d better make the next one," Dawson said by phone this week. "When the wins start coming, that’s why you put in all that hard work. Feeling the pressure build each week with the playoffs, that’s a blast." Finally, 15 years into his NFL career, Dawson is on to the second round of the playoffs. He spent the first 14 years with the Browns, where he kicked in just one playoff game. After playing both 2011 and 2012 under the franchise tag, the Browns changed leadership again last offseason and changed kickers after not offering Dawson a contract. 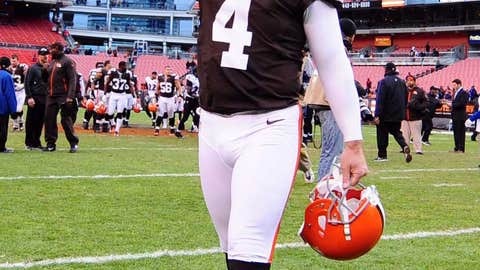 Phil Dawson spent the first 14 years of his NFL career with the Cleveland Browns, where he kicked in just one playoff game. Like he did during his final two years with the Browns, Dawson chooses not to talk to about contract negotiations. Asked to reflect upon the events — or non-events — last February and March that led to his hitting free agency and eventually signing with the 49ers, Dawson said, "It was a mixed bag. I was absolutely thrilled to have the chance to become a 49er and be a part of something special. That excited me and that motivated me. I was very grateful for the opportunity. "At the same time I was disappointed, I was saddened, to have to leave the Browns. So much of my mentality all those years in Cleveland was I wanted to finish what I started. I wanted to be a part of bringing a winner to Cleveland. When the realization hit that (returning) wasn’t going to be possible, I dealt with some emotions. "But I had 14 wonderful years there and that’s a lot more than I could have ever dreamed of. Someday I’ll be able to sit down and really reflect on what all that meant. Once the change happened I was immediately so busy preparing to be a 49er and getting ready for the season that I haven’t had the luxury and the opportunity to go and really reflect on it." Wtth 32 made field goals in 36 tries in the regular season and three in three tries in subzero temperatures in Green Bay last weekend, Dawson is having his best season. It’s been his busiest, too, as he had a career high 140 points in the regular season. He left the Browns as the franchise’s second-leading scorer, but he never scored three more important points than ones his 33-yarder delivered to beat the Packers. "You put a lot of work in and you’re never quite sure how things are going to turn out," Dawson said. "Believe me when I say I never take anything for granted. It’s been a tough year — a lot of transition, a lot of change for me. From the offseason getting to know my new teammates and coaches and my surroundings, it wasn’t necessarily an easy transition but it’s been a good one. "The weather was such an issue last week (in Green Bay) — I’m a psycho about trying to figure the conditions — I didn’t go big picture at all on what it meant or how big it was or whatever. I mean that. I stuck to my routine and tried to draw on my past experiences in cold weather. I visualized it. "It didn’t sink in until the flight home that it was a big deal. There’s no great story with the buildup. It was like any other week, any other big kick. I hope that’s the case going forward. You stick with the plan and hope you have time later to celebrate what you accomplished." A day after the kick, Dawson allowed himself a few minutes to check some of his Twitter mentions. After seeing "dozens" of notes of support from Browns fans, he tweeted: "Hey CLE, just want to thank y’all for your continued love. Much respect & appreciation for y’all." Hey CLE, just want to thank y'all for your continued love. Much respect & appreciation for y'all. More than 3,700 people had retweeted Dawson’s message by Thursday afternoon. "I was getting a lot of phone calls, texts…I read through some tweets and I could tell that game meant a lot to a lot of Browns fans and people who have supported me for so long," Dawson said. "I wanted to let them know that I always appreciated their support. For those who continue to support me, it means a great deal." With the uncertainty brought by the end of his Browns contract following the 2010 season, Dawson moved his family from the Cleveland area to Austin, Texas, where the family plans to settle following his career. The oldest of his three children is in middle school, so "not moving again is best," Dawson said. His wife, Shannon, and his children come to 49ers home games, as they did in 2011-12 in Cleveland, and Dawson gets home when he can during the season. He sees familiar faces in the 49ers building. Former Browns teammates Ray Ventrone and Eric Wright are on the other side of the locker room. Colt McCoy, like Dawson a University of Texas alum, keeps his locker very close to Dawson’s. When McCoy first met Dawson whil playing quarterback at Texas, McCoy called him "Mr. Dawson." "He doesn’t call me that anymore," Dawson said. "But it is nice to have him here." Former Browns head coach Eric Mangini is on the 49ers staff; so is Brad Seely, who was the Browns special teams coach under Mangini. Dawson also said he "takes a lot of crap" from 49ers offensive lineman Alex Boone, a Cleveland native who reminds Dawson he was going to Browns games and watching Dawson when he was in middle school. "I’ve had more than enough of Boone," Dawson joked. He’s trying to join Boone and the rest of the 49ers core in chasing a third-straight NFC Championship Game and a second shot at winning the Super Bowl. "It’s just kind of a known around here that there’s a very high standard and winning is expected," Dawson said. "When you’re a new guy around here, you just step right in with the flow. You buy in and you don’t waste a lot of time talking about what’s expected. The first thing you see when you walk in the front door is five Lombardi Trophies so right then you know what the goal is. It’s a fun thing to be part of. It’s a good kind of pressure. "Having played for several different coaches and different systems and ways of doing things (with the Browns), that certainly helped me come in here with an open mind. Obviously being in a new place was different. With all the change in Cleveland I was still driving to the same place, getting dressed at the same locker, kicking on the same fields, and that was probably the biggest change – losing that comfort level. I always think there’s an opportunity to make the best of your situation. Some people looked at all the change in Cleveland as a negative but I looked at it as an opportunity to learn and it served me well this past offseason." Two weeks from his 39th birthday, Dawson is very much on top of his game. He’s connected on 88.9 percent of his field goals this season, 88.5 over the last three seasons and 84.5 percent for his career. "I joke with people (that) you put in all the hard work, why shouldn’t you get better?" he said. "I’ve had a lot of great teammates and great coaches who believe in me. If you get the opportunity to make big kicks and you’ve put in the hard work and have the confidence you’re going to make big kicks, there will come a time when you make big kicks." With one playoff win in the books and the 49ers two more from a return trip to the Super Bowl, Dawson’s kicks have never been bigger.